Call or email to book your session today!! ALL sessions are done throughout various locations throughout WNY & offer unlimited wardrobe changes. The session fee is required at booking and the minimum order requirement is due the day of the session. Gift prints: start at $45 All prints are printed on luxury linen photo paper and are ordered through our professional pro lab which is not open to the public. We only offer products that will last a lifetime and are of the highest quality. No prints are done on our studio printers. Packages: Packages start at $200. Digital file packages include fully edited high resolution digital files with print rights + black and white versions of each. Q. Why are high school senior portrait sessions with Portrait Pretty Photography so different? A. That’s easy, I help put my seniors at ease and we have fun! Each and every senior I have had the honor to work with has had a blast with their senior portrait experience. When you schedule your high school senior session with me, your day is your day. We will not be rushing, and we will take all the time needed to get those perfect shots. My time is available to you, I will not be rushed, and I will always be available to talk to text about the perfect outfit, locations, colors, vision and concepts you have in mind for your session. I am here and will guide you through each step of the way. Not only that I bring tons of jewels for you to pick from to dazzle yourself for your session. Q. Do you offer studio senior portrait sessions? A. We offer studio senior portraits for yearbook picture and fine art concept shoots only. Our style is fresh and modern and hold the senior portrait sessions in the great outdoors at various locations that suite your style throughout WNY. Q. When must ordered be placed? A. All orders must be placed within 2 weeks of the viewing. Expired galleries are removed after 2 weeks. $100 upload fee is required to upload expired galleries. Q. Can I purchase digital files only and print at my leisure? A. Absolutely, if you would like to keep it simple as most parents do, you can purchase from one of our digital packages and waive the order appointment all together. All digital packages come with print rights and we will make strong recommendations as to where you should have the files printed. Q. What can I expect to spend? A. 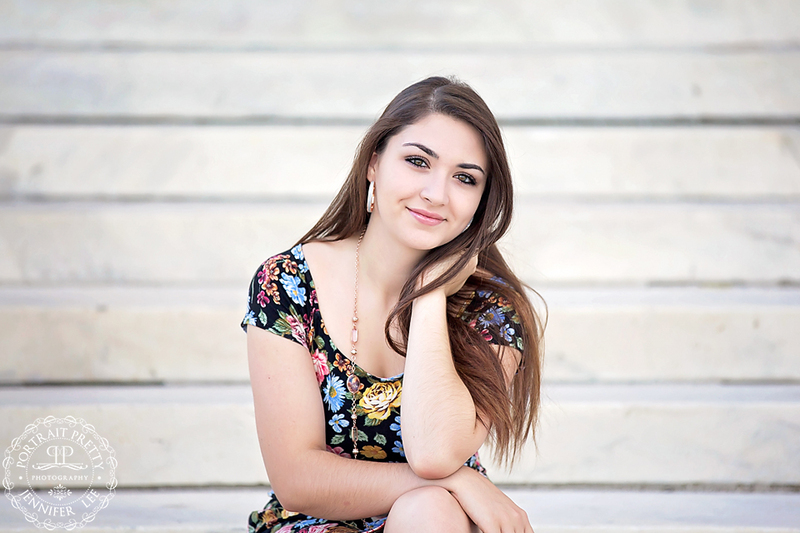 Most parents invest between $995 – $2,800 for the custom senior portrait experience with Portrait Pretty Photography. There is a minimum print order of $600 due the date of your session, the $600 will be applied towards your print order. Your ordering appointment is to take place 2 – 3 weeks after the session is complete. The date will be reserved at booking or the date of the session. We offer to come to your home, or you can come to our studio. The session fee is for the time and talent of the photographer and is for the senior portrait session only. If you have any questions feel free to contact me. Q. What if we don’t cover all the locations I want in the 4 hours?